The price includes the use of a 3ft x 7ft (0.9 x 2.1mtrs) table with enough space to stand behind the stall. Stall sites do not allow for any trailers or cars. NOTE: Limited powered sites are available for $2 extra. Please bring a long extension lead (15mtrs or so). This fee will be collected from you when we collect your stall tickets. Please keep your stall tickets with you on your stall as they are collected during the day. For market FAQs, please click here. The Ferntree Gully Road gate opens at 6:00 am and all stall tickets must be purchased at the ticket box. After you have purchased your stall ticket, proceed down the roadway towards the market and join the queue on the left hand side of the road. Stall allocation from this queue commences at approximately 8:00am. Our staff will need to be advised of how many stalls you require and what you are selling. We then direct you to your stall. Once you have promptly unloaded your stock onto the stall, your vehicle must be removed from the market pavilion by 8:30am as this is when the markekt is open to the general public. It is advised that you attend our market initially as a casual stall holder. After such time, we recommend that you discuss your interest in becoming a “regular” stall holder with the Market Managers. It really is a simple process and your Market Manager will show you how. One of the perks of becoming a regular stall holder is you have a reserved table position and you do not need to wait in the casual queue. However, to do this you must have the initial discussion with your Market Manager when you are a casual stall holder. We recommend bringing a tablecloth to cover your table, making it look more presentable. You should also bring a chair or stool as it can be a long day if you are standing up. Clothes racks are a fantastic way of displaying clothing items and also great for creating extra space on your table. If you place too many items on your table, it could look cluttered and customers may avoid your stall, so keep your items neat. You can keep boxes/bags under your table so that you can replace items on the table once you have sold them. Do not overprice your items!! People come to the Market to pick up a bargain and feedback from past stallholders found that the more reasonable the price, the more they sold. Make sure you bring along some plastic bags that you can use to put your items in when they are purchased by the customer. Ensure that all items are visibly labelled with a price tag. This can be each item individually or in groups of items that are the same price. Be approachable, smile and greet your customers. Something so simple can make a big difference in the amount of people who will approach your stall. If you are a regular stall holder and have extra people / employees working for you, you are entitled to an employee entry card. You may acquire one of these cards by asking anyone of our staff on the day. Stall holders must remove all unsold goods at the close of the trading day. Stall holders MUST leave their stall free of all rubbish at the end of the trading day. All cardboard must be flattened and placed into the Green Recycling Bins and all other rubbish is to be placed in the Green Rubbish Trailers, both located around the outside of the pavilion, near the major exits. The sale or the offering for sale of Illegal, counterfeit or stolen products on these premises is prohibited. It is your responsibility to contact the appropriate authorities for information regarding regulations and / or licenses for the sale of particular goods. If you are selling pre-packaged foods, you must bring a copy of your registered kitchen certificate. By law, pets are not allowed to be sold in markets. No Dogs allowed on the premises. The management of Caribbean Gardens accepts no liability or responsibility of any kind what-so-ever as to renting selling space and is in no way responsible for the legal safety of those people who wish to use the premises, nor does it accept responsibility for transactions with the public, but reserves the right to eject any person and their chattels from the premises without showing cause. If you require any other information, please phone, or see one of our staff on the day. Regular stallholders will attend on a regular basis each Sunday unless prior notice is given (at least 24 hrs prior to trading day). Please advise office or market staff in writing of impending holidays. Email [email protected]aribbeangarden.com.au and fax no: 9756 5050. Regular stalls must be occupied before 7.45am. Management has the right to re-allocated stalls not occupied by this time. Stalls to be kept neat, tidy and safe at all times. Before leaving the market all rubbish to be disposed of in rubbish bins or trailer (located around market). (boxes and cartons to be flattened first). It is the stallholders responsibility to have second hand dealers licence etc if necessary. Vehicles are not permitted in the market building during market hours. The sale of stolen or counterfeit goods is a criminal offence and is prohibited. Stalls are not to be transferred to another stallholder without Caribbean gardens consent. Subject to management regulations at Caribbean gardens market. On any given Market Day (Wednesday and Sunday) you will find 100’s of market stall holder with a variety of items for sale. With over 2 acres (10,500sqm) under cover we are one of Melbourne largest and most well known markets. We also have fantastic casual stall holders rates and encourage new casual stall holders to try their hand at selling unique and interesting items. More information on the Stall Holder page. Our Babes to Kids and Maternity Market is a place where you can sell all sorts of baby to kids clothing and maternity wear, toys, cots, prams, change tables, bibs, blankets and all types of accessories. This section of the market operates on the first Wednesday of every month (with the exception of January). It’s a great day out with free train rides between 9am and 11am (excluding school holidays), plus free face painting in the pavilion. Click here for the next dates. Please note: When booking ensure you enter the correct date of the market or the application will not be accepted. You will need to fill our one application for each date. LINK: Please check our calendar for further events and markets. Book in to have your own stall on one of our busy Wednesday Baby Market days! To book your stall space simply fill out this form. Then come the market day to secure your spot. Clothes hangers can be hired for an additional cost. You will need to enter through the Ferntree Gully Road entrance in the morning. The gates will open at 6am and we recommend arriving between 6am and 7am. The latest you are able to arrive and be allocated a stall is 7:30am. You will pay for your stall/s at the Ferntree Gully Road Ticket Box. The staff in the ticket box will give you your stall ticket/s which a Market Attendant will collect mid morning along with any additional charges for power or extra spaces. You will follow the other cars through to the pavilion where you will queue in you car. As soon as a Market Attendant becomes available, they will ask you how many stalls/floor spaces you require. 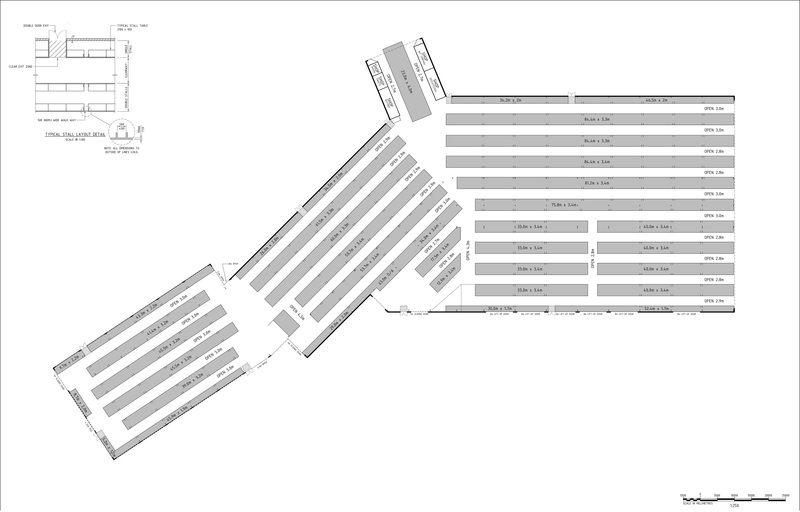 They will then allocate you your stall/s and you are able to drive your car into the pavilion next to your stalls. You will then unload your items onto the table and remove your car from the market to the nearby parking to allow room for other stallholders to come in and unload their belongings. Once you have parked your car you are able to set up your stall. All cars need to be removed from the pavilion by 8.30am as this is when we open to the public. The Market will finish at 3pm, which is when you are able to drive your car back into the pavilion and load your car with any items that your were unable to sell through out the day. Please note that there are many guidelines relating to the selling of Baby and Kids Clothing, Toys, Infant and Nursery products. It is your responsibility to ensure that you are aware of and comply with these guidelines. All products need to be clean and in working order and you can find all the guidelines on the ACCC’s website, www.accc.gov.au or by contacting them on 1300 302 502. Cost: $5 per stall until and including September 5th 2018. After September 2018 the stall rate for the Babes to Kids Market will be $16. Stall hire includes space of 1.5m x 2.1m, including the use of a 0.9m x 2.1m trestle table. Please note that this table can be removed by a staff member if you would like to have a rack or display large items. Rack hire is available on the day for an additional cost you will require an extra stall space (per rack) at market rates to provide room for the rack. Rack numbers are limited so first in first served despite letting us know through the online booking form. Alternatively you are able to bring your own rack for use on the day. Each rack requires an additional stall ticket paid for at the gate. For example: if you require two stall spaces and a rack, this is equivalent to three stall spaces plus the cost for the rack hire. Stalls to be paid in cash at the gate. Racks to be paid for upon ticket collection time to Market Managers. Food and drink facilities are available at the Caribbean Gardens Café or Take a way. Many people forget to eat and drink throughout the day, so make sure you keep yourself replenished. The Australian Government has advised that any car seat that has been in an accident is not safe and should be disposed of. Please do not sell a car seat if it has previously been involved in an accident. Please note that we are not able to change any money (notes or coins) so please ensure you come prepared with enough small notes and coins. We wish you the very best for the day and look forward to seeing you! For business wishing to submit an expression of interest in the CARIBBEAN MARKET please fill out this form. This is not an application. The Market Manager will be in touch for further information as required. Please tick boxes that apply to your business. Please list the other markets you have set up at before.